Happy Friday ,all! Today I have the pleasure of introducing you to another San Diego Indie Craft Market vendor who also happens to be the head of the San Diego Etsy Society, Brenna Hopkins! She is truly a gem! so! without further wait I give you our interview! Please tell us a little about yourself! 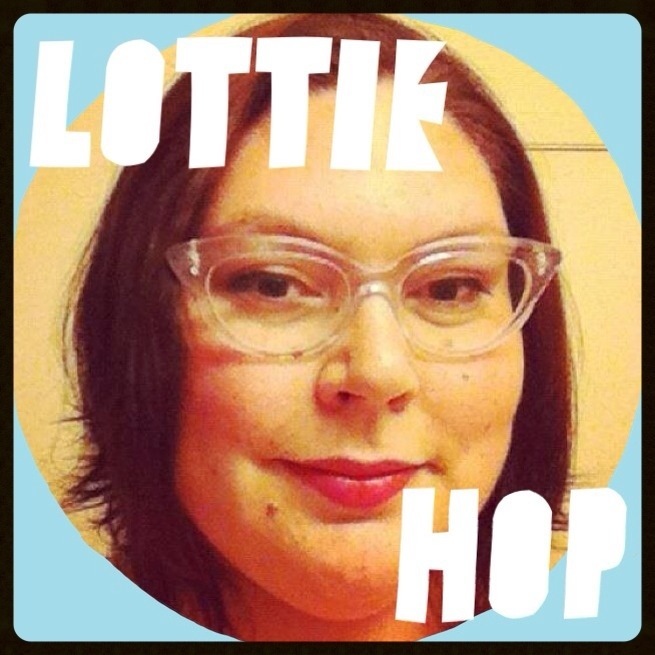 Hello, I’m Brenna Hopkins of Lottie Hop! I have always been an artist. When I was 5 I was drawing comics, when I was 11 I started making jewelry and sewing, and at 27 I taught myself to crochet. I love all types of crafting. I used to work in the food industry in a patisserie, but I am now a stay at home mom to my beautiful two year old daughter Charlotte. You definitely have many talents! What types of pretties do you sell in your shop? I make what ever strikes me as fun and interesting to make. Right now I make jewelry and accessories using my extensive collection of antique and vintage buttons and sewing notions. I also make jewelry using vintage toys, prizes and charms, which is how I got my start in jewelry making when I was a kid. We didn’t have a lot of beads and jewelry making stuff, so I had to improvise with what I had laying around. I like to be resourceful with my crafting, it’s a habit that never went away. I also crochet toys using left over yarns from projects people never finished, or if they bought too much yarn, I grab it and make something of my own. I also make hats and head bands, and sometimes I take commissions for toys if someone has something specific in mind that inspires me. What are your favorite items to create with? Antique and vintage buttons, especially very old mother of pearl buttons, black glass and jet buttons from the Victorian era, shoe buttons and mid century colorful plastics. I love crazy colored yarns from the 70’s. And I really like working with wire. What types of items inspire most to create? At the moment I’ve been inspired by a book I bought that has all of Harper’s Bazaar’s clothing and jewelry adverts from the Victorian era in it. It’s really lovely. I am also inspired by music. My whole line of antique button jewelry I recently made was inspired by the album Ceremonials by Florence and the Machine. And which of your five favorite creations have you decided to share with us? Gimball the baby octopus. My blue and green mis-matched button hair pins, the buttons don’t go together at all, but I love them. My grilled cheese earrings, they’re a new creation and they’re my favorite thing I’ve made so far right now. My grey mammoth earrings, they’re just fun. And lastly the pig with the top hat I made on commission for my friend Amy. And where can the good people connect with you online? Please visit the San Diego Indie Craft Market on June 23rd to meet Brenna in person! More SDICM details can be found here: https://www.facebook.com/SDIndieCraftMarket?fref=ts. I promise that you will not be disappointed! Now rush through the remainder of your Friday and enjoy the weekend!